Fire-resistant, welded 18-gauge steel cabinets store flammable liquids and waste safely and securely, protecting personnel and facilities. The double-wall design features a 3.8cm (11/2") insulating air space. 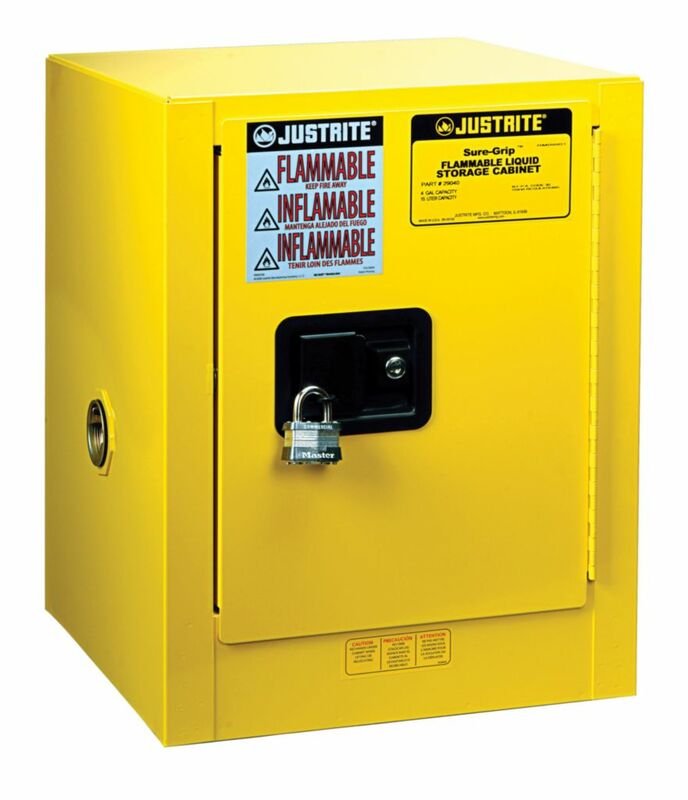 A 3-point stainless steel bullet latching system further reduces the risk of fire. 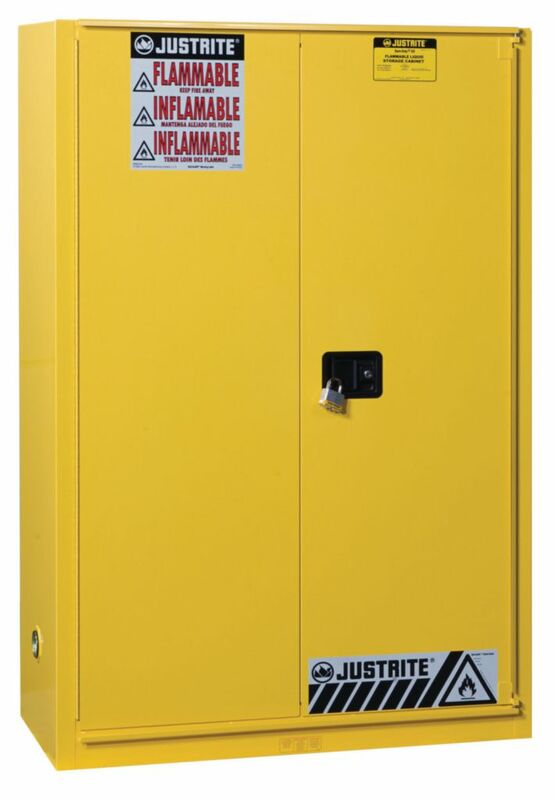 Exclusive features include U-Loc™ handles that include two keys and accept padlocks, Haz-Alert™ reflective exterior labeling, and galvanized steel SpillSlope™ shelves that direct all spills to the 5.1cm (2") leakproof sump. Adjustable shelves provide a 159kg (350lb.) safe allowable load. Built-in grounding connector prevents static buildup. Four adjustable leveling feet ensure a wobble-free base. 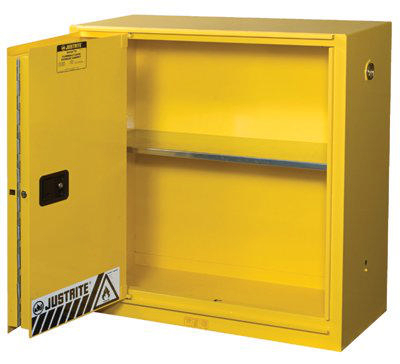 Undercounter cabinets offer quick access at workstations and are sized and fitted with a recessed kickplate to mount flush with existing cabinetry. Wall mount cabinets (hardware included) are ideal for small container storage and can be positioned throughout the workplace. Piggyback cabinets are designed to mount atop standard 114L (30gal.) and 117L (45gal.) cabinets, but can also be used independently as benchtop units. Flammable waste cabinets are designed for temporary collection and segregation of waste liquids. 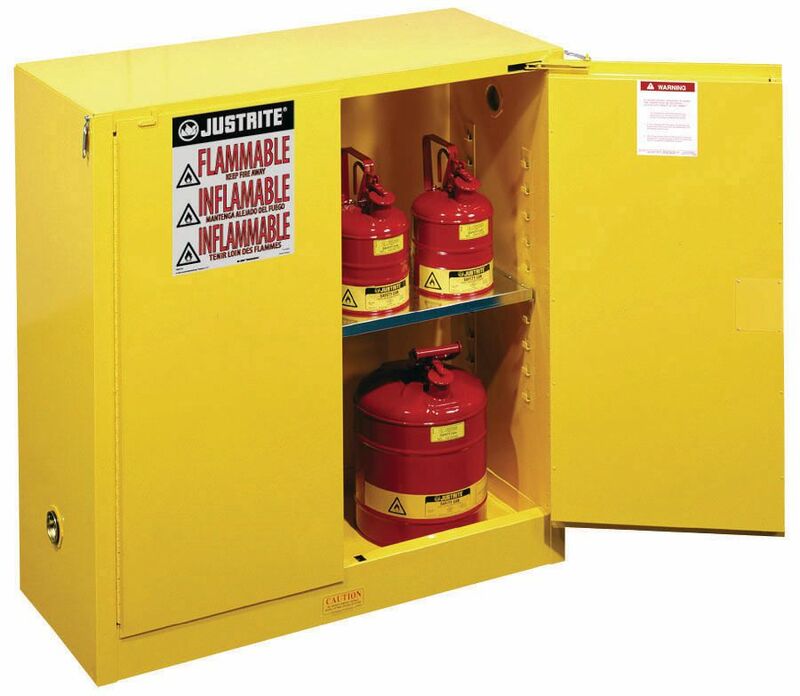 Certifications: All cabinets are OSHA compliant, meet NFPA Code 30, and are independently tested and FM approved. 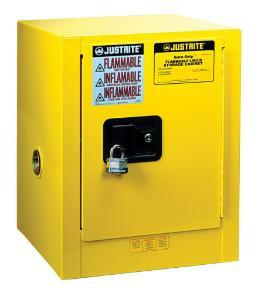 Ordering information: All cabinets include manufacturer's 10-year warranty. See 97001-314 series for extra shelves and other accessories.